IRender nXt Version 4.0 has been released. This version include a considerable number of new features and improvements over Version 2.0. Volumetric Fog is a feature in IRender nXt incorporate the effects of light reflecting from or being blocked by fog or haze. See: Volumetric Fog for examples and advice on settings. Create PDF is a feature to create an interactive 3D PDF Presentation using your model and your Rendered Image. Both the 3D Model and the Rendered Image are displayed on the first page of the PDF file, with a set of buttons for the user to choose between the two. 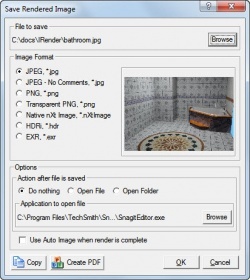 Render your model, and use the Save Image icon on the toolbar to load the Save Image Wizard. Select Create PDF from the bottom of the Wizard. Enter the PDF settings on the next dialog. JPEG - with and without comments. PNG files - compressed and no loss of quality. Transparent PNG files - compressed and no loss of quality. Native nXt Image - nXtImage format contains the intensities, depths and materials for use with with the nXt Image Editor . HDRi - saves the rendering image with an intensity channel. EXR - another format with intensity information. Lighting Channels is an important new feature of IRender nXt which lets you quickly adjust light sources. By assigning channels to sun, sky, and groups of lights, you can quickly adjust the intensity of each channel with a slidebar and immediately see the effect on the final rendering. You can quickly adjust the intensity of each channel with a slide bar and immediately see the effect on the final rendering. This will saves time both in determining the relative intensities to use for light sources and in fine tuning the final image before publication. In Version 3.5, Lighting Channels are integrated into the Batch Renderer, as well as used separately with the nXt Image Editor. Adjust Lighting Channels from Batch Renderer. Material Channels are used to adjust the color or luminance of pixels rendered from a material after rendering. You can use a, (non panoramic), HDRi image as a background. Converting standard image to HDRi. nXt Path Tracer is a new rendering engine for IRender nXt. nXt Packet Mode processes packets of rays, while nXt Path Tracer processes individual light paths. Because of some shortcuts, such as Daylight Portals, and other aspects of the rendering process, nXt Packet Mode create a usable image in fewer passes. nXt Path Tracer often requires more passes before the image gets smooth. Path Tracer image after 1,500 passes. Batch Settings wizard allows you to create a new folder when browsing folders. Fixed problem using Caustics with Packet rendering mode. Fix problem where the close button on setup or stop rendering button is starting a rendering again. Fixed bug where colored mirrors were not marked as metallic. Fixed bug when extracting edge lines for foreground overlay while rendering to a different size. Fixed autosave to save .nXtImage files when desired. Fixed a bug when an image returns a nil value for the image name. Fix a bug when rendering with "indexed" .PNG files. Customize Toolbar to use just the Icons you want. New, optional, rendering settings dialog to review settings just before rendering. Materials and other settings can be set directly during the rendering process, and then restored to the SketchUp model. Clay Rendering - automatically create an all white rendering. 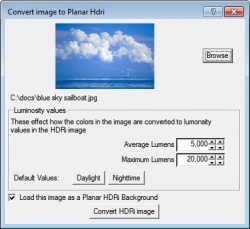 Sky Saturation - ability to set the amount of color in Automatic Skies. Added displacement maps for advanced bump effects. Added Draft Render Quality which renders about 4 times faster with some loss of image quality. Animation - Fully rendered movies. Auto Reflection - Automatic reflection for metal, plastic, tile and wood. Automatic Bump Maps - 3D lighting effects from 2D surfaces. Background Image - Place image behind rendered geometry. Batch Rendering - Render later, or from a remote machine. 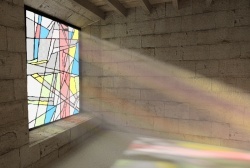 Caustics - Realistic transparency for glass. Clay Rendering - Create monochrome renderings of model. Daylight Portals - fast processing of exterior lighting. Depth of Field - Focus and Blur. Edge Highlighting - Enhance detail by rendering SketchUp edges. External Rendering - Render in a separate process so you can continue to use SketchUp. Foreground Image - Place image or watermark in front of rendered geometry. Fully integrated into SketchUp - All Rendering settings saved with SketchUp model. HDRi Skies - Lighting, reflections or visibility from special image files. High Resolution images - Increased image size for high-quality images..
IRender Ready Content - Preconfigured components in 3D Warehouse. IRender nXt Material Library - Predefined materials. IRender nXt Plant Library - More than 500 predefined plants. Indirect Lighting - Improved renderings with effects of reflected light. Lamps and Light Fixtures - Premade components for point, spot and ceiling lights. Laptop Seat - Free second seat for your laptop. 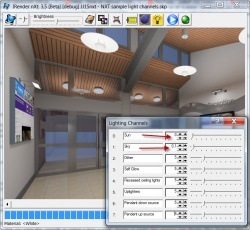 Integrated Lighting Channels - Adjust light intensity during or after rendering. Lighting Presets Tab - Quick settings for typical environments. Material Wizard - advanced features - Multiple Properties per material. Material Wizard - Define properties for materials. Object Properties - Diffuse lighting, Daylight, Caustics. Path Tracer - New Rendering engine for higher quality lighting and reflections. Procedural Bump Maps - marble, wrinkle, bumps, etc. RPC Objects - High quality 3D objects. Reflections and Mirrors - Define reflection for any surface. Render directly from SketchUp - One click rendering. Rendering Editor - Set options and edit materials from rendering window. RpTreeMaker - Fractal 3D trees. Section Planes - ability to section off part of the model. SketchUp Components - Render groups and components. SketchUp Materials - Textures, transparency and colors from SketchUp materials. Sun and Shadows - Use SketchUp sun position and settings. Transparency - Use SketchUp transparency settings. Two Point Perspective - Keep vertical lines parallel while panning the view. Visible Light Paths - Spot Lights which shine as if in a haze. Watermarks - Add logos, foreground images or textured masks to the rendering.